The one pan dinner fad maybe came and went but it’s still totally my thing! 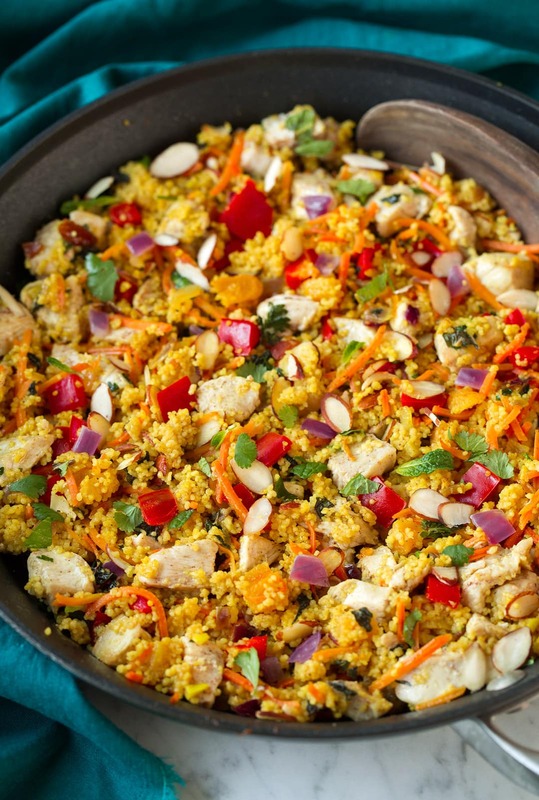 This One Pan Moroccan Chicken and Couscous is one of my favorite one pan dinners to date! 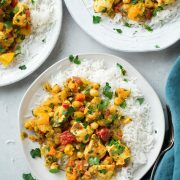 It has a delicious blend of flavors and textures, it’s a healthy dinner, and it’s brimming with those irresistible deliciously spiced Moroccan flavors. I’ve actually already made this dinner probably 4 or 5 times over the last few months so it’s due time that I shared it. 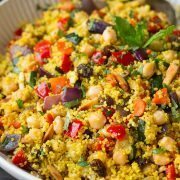 It’s a combination of two summer favorites (this Grilled Moroccan Chicken and this Moroccan Couscous with Roasted Veggies and Chick Peas), but I blend them together into something that can be made together on the stovetop. 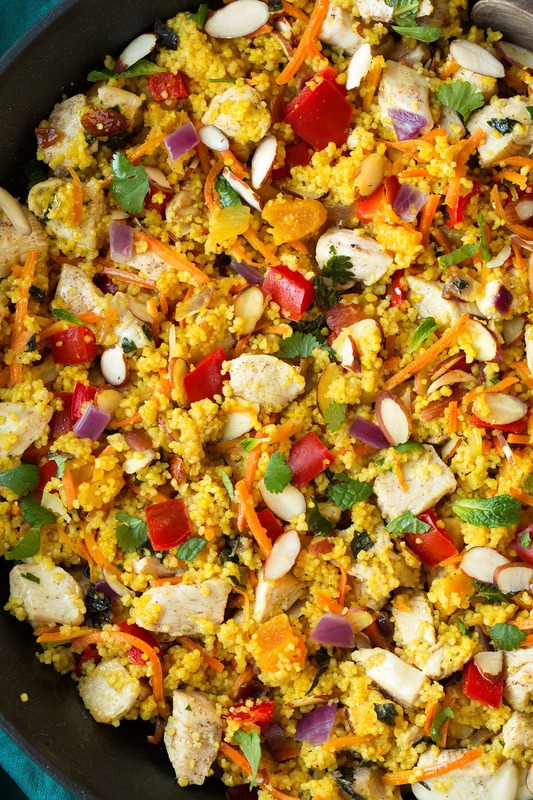 Layered together are diced chicken breasts, sauteed veggies, lemony couscous, sweet apricots or raisins, spices, fresh herbs, and sliced almonds and together they harmoniously create one unforgettable dish! Because who wants a bland and boring chicken dinner?? 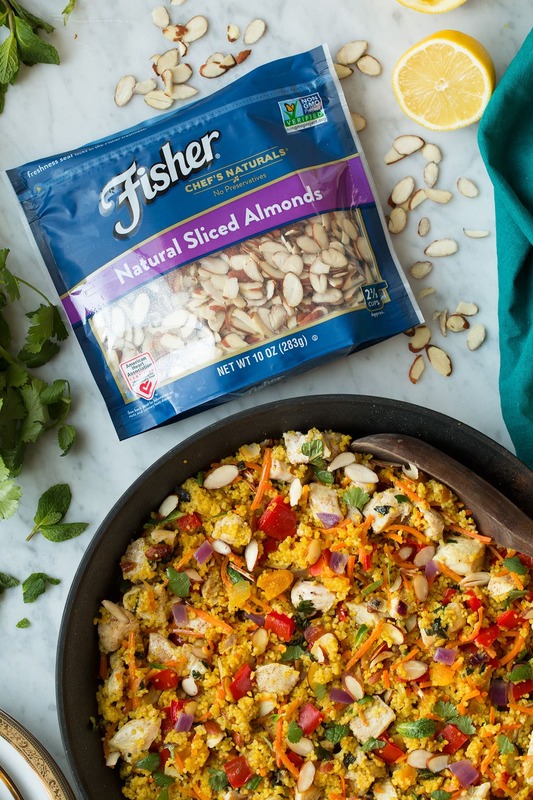 My go-to almonds for this recipe are Fisher Almonds (you can use sliced or slivered). Fisher nuts are non-GMO Project Verified and contain no preservatives. Plus there are over nine varieties of Fisher nuts that are verified by the American Heart Association as heart healthy so you can feel great about adding these to your favorite meals or snacking on them midday. Also the pantry friendly stand-up bag helps keeps the nuts fresh! I love Fisher nuts and this One Pan Moroccan Chicken and Couscous just wouldn’t be the same without them! You can purchase Fisher nuts on Amazon. For more recipe inspiration check out FisherNuts.com. 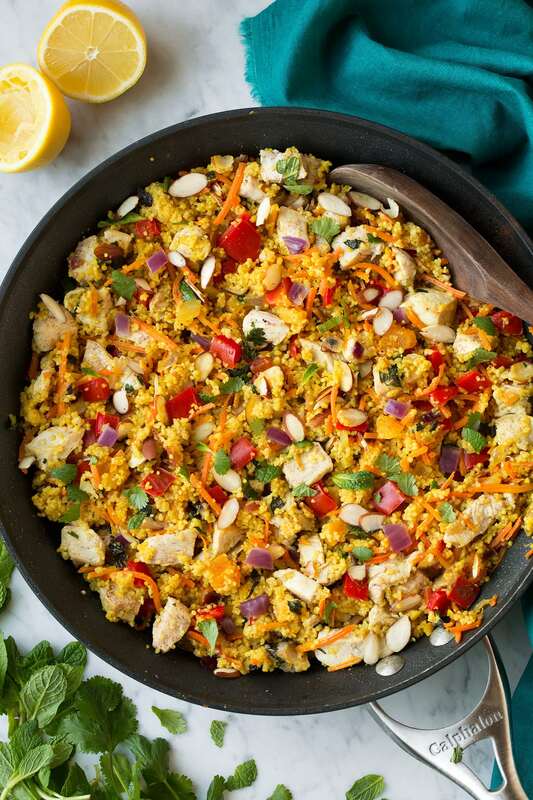 This is one of my favorite one pan dinners to date! 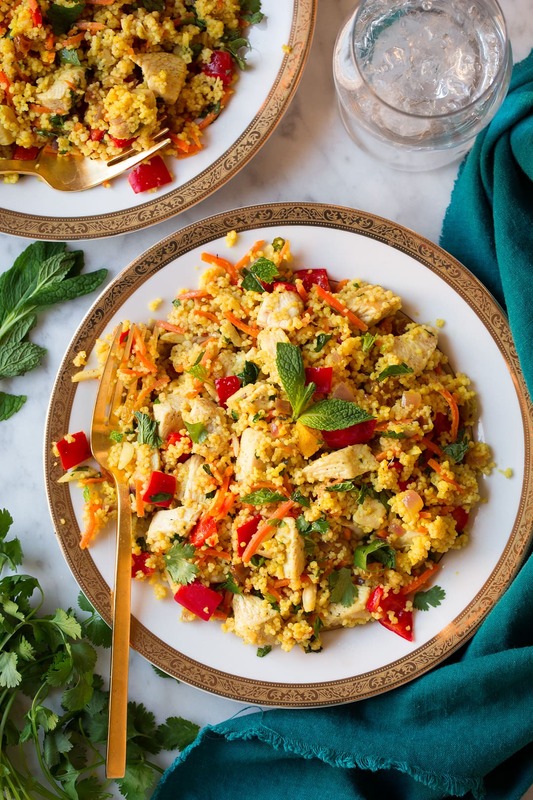 It has a delicious blend of flavors and textures, it's a healthy dinner, and it's brimming with those irresistible deliciously spiced Moroccan flavors. Heat 1 Tbsp olive oil in a non-stick 12-inch saute pan or deep skillet over medium-high heat. Add chicken to pan season with salt and pepper, 1/2 tsp cumin, 1/4 tsp coriander and 1/4 cinnamon. Cook, turning occasionally, until cooked through, about 7 minutes. Transfer chicken to a sheet of foil and wrap to keep warm. Heat remaining 2 Tbsp oil in skillet. Add in bell pepper and onion and saute 5 minutes. Add in carrots, garlic, remaining 1/2 tsp cumin, 1/4 tsp coriander, 1/4 tsp cinnamon and turmeric and saute 1 minute. Add in chicken broth and apricots, season with salt and pepper to taste and bring to a boil (it shouldn't just simmer on the edges it should boil lightly in the center as well). Stir in couscous then remove from heat and let rest 5 - 6 minutes until tender. Stir in chicken and any accumulated juices, lemon juice, almonds, cilantro and mint (you can also add in little more broth if desired). Serve warm. David Fankhauser: While the flavors were interesting, the overall effect was disappointing. The couscous beads were tough (perhaps should have been cooked separately and then added?). The multiple ingredients called for in the recipe may have been more complex than needed for a good flavor. For instance, I wonder why red onions were specified, because when they are cooked, they are essentially indistinguishable from regular yellow Spanish onions. If the almonds had been toasted, the flavor would have been boosted. Jeanne: So very good! Colorful and full of flavor. I will definitely make this again. 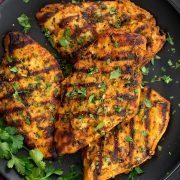 It is an easy week night meal that comes together very quickly. Had enough for leftovers for lunch tomorrow.